Friday June 9 1911 Cam home early. At noon Hattie Stevens brought Winnie here. We both slept in afternoon and sat on the porch to visit in evening. A frightful hot day. Letter from Lydia. Saturday June 19 1911 I went down with Winnie at 9.15 I went to the Dr office. Got home at 11.40 and got the dinner. Will to town in afternoon. I did not do much of any thing. down home at 8.15. Mother about the same. Wrote Lydia Sunday June 11 1911 Came home at 6 and did morning work. I felt very much discouraged about Mother seems to me her foot looked worse last night. I slept in afternoon. But went down home and spend the evening and think Mother is better. 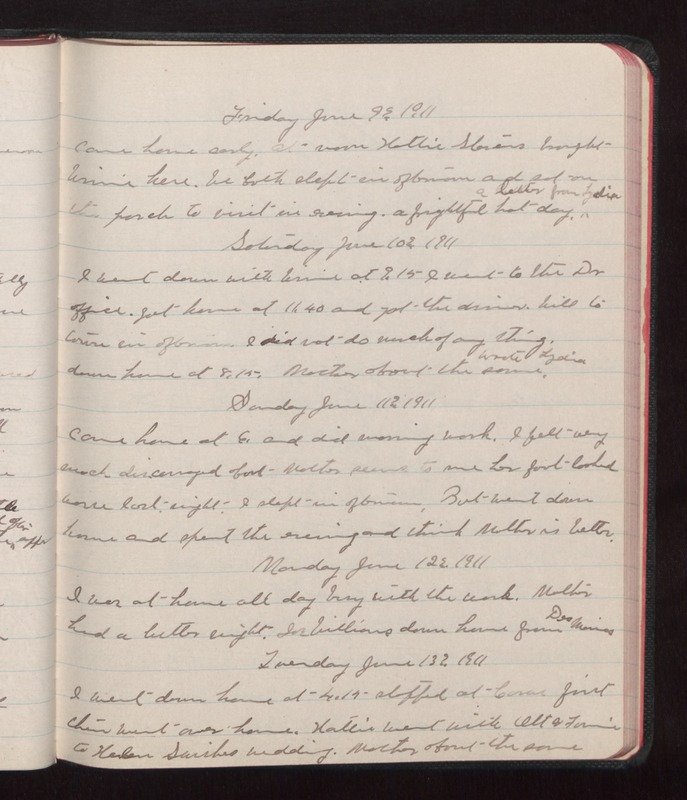 Monday June 12 1911 I was at home all day busy with the work. Mother had a better night. Joe Williams down home from Des Moines Tuesday June 13 1911 I went down home at 4.15 stopped at Cors first then went over home. Hattie went with Ott & Fannie to [Helen? Harlan?] [Swishers?] wedding. Mother about the same.